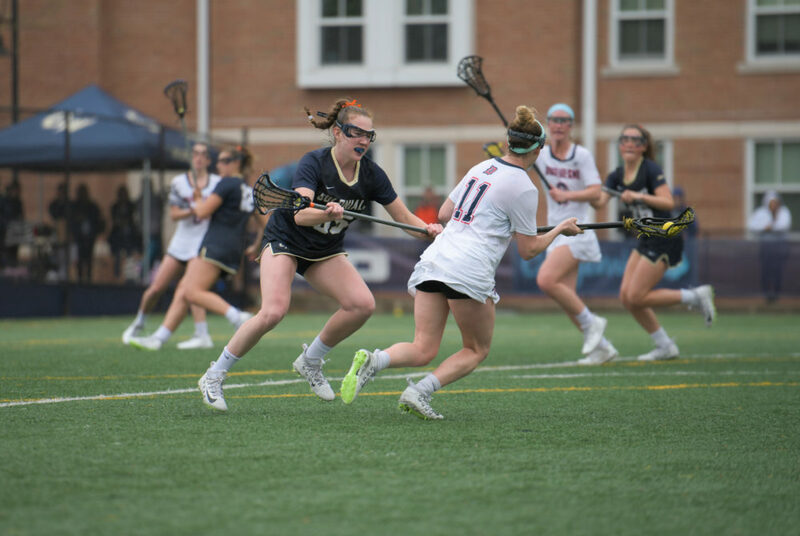 Junior midfielder Katie Quinn defends against Duquesne in the first half of a 20–9 loss in GW's final home game of the season. Lacrosse fell to Duquesne at home Friday in its widest defeat of the season. The Colonials (5–10, 3–4 A-10) surrendered to the Dukes (7–6, 2–5) 20–9, conceding a season-high 20 goals. The loss places GW on the verge of making the Atlantic 10 Championship – the top six teams qualify for the tournament and the Colonials are currently positioned No. 6. The Colonials have not competed in the A-10 Championship since 2013, when the squad fell in the semifinals to Massachusetts. Junior midfielder Aidan Cage picked up two goals and three assists during the game. Junior midfielder Katie Quinn also jumped in on the action, netting two of her own goals. Sophomore goalkeeper Jenna Oler denied 13 shots, her third-highest number of saves on the season. Duquesne came out swinging early to score just 39 seconds into the contest. Junior attacker Morgan McDonnell netted her 16th goal of the season two minutes later, evening the score 1–1. A save from Oler kept the Colonials level for several more minutes until the Dukes scored and took the lead for the remainder of the matchup. “We had a hard time today adjusting to what they were doing after we figured their team out,” junior defender Posie Paoletta said. GW struggled to suppress Dukes’ offense. About 18 minutes after the Colonials evened the score, six Dukes players picked up 10 more goals in the first half. Duquesne capitalized on several lapses in the Colonials’ defense, making swift cuts up the middle of the field. The Colonials headed into the locker room trailing the Dukes 11–5. GW attempted to reset the tone with an early goal in the second half. But Duquesne snuffed any chance of a comeback, piling on three goals in two minutes to raise the score 14–6 with more than 26 minutes left in the match. The Colonials scattered three more goals throughout the half. But the Dukes could not be stopped, adding six more goals to finish the afternoon 20–9. Paoletta said the Colonials identified some strong areas in their defense to focus on heading into the next matchup against George Mason. The Colonials have two remaining games left in their season. Cage said they will treat their match against Duquesne as a learning opportunity to prepare for the upcoming games. The Colonials return to action Sunday at George Mason. The game is slated for 1 p.m.